Tens of thousands of haredim protest construction work of a light rail to take place during Shabbat in the city of Bnei Brak. 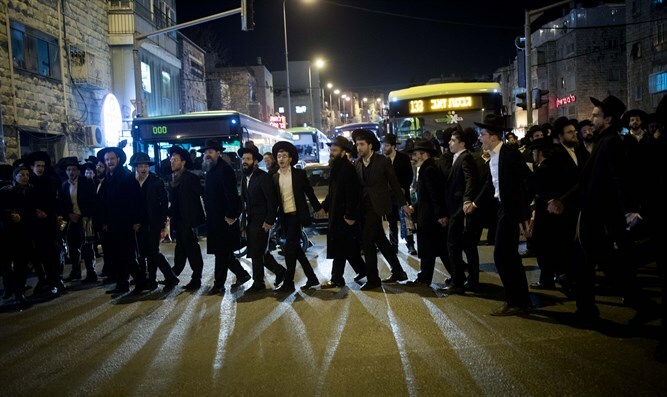 Tens of thousands of haredim on Friday evening held a rally in protest against construction work of a light rail to take place during Shabbat in the city of Bnei Brak. During the rally, Highway 4 was blocked between the Morasha interchange and the Aluf Sadeh interchange, and central streets in Bnei Brak were closed in both directions. Hundreds of police officers were deployed along the main roads on which the protest took place. "We will apply a zero tolerance policy towards those who seek to disrupt public order and may pose a danger to public safety," the Israel Police stressed, though they said the rally was coordinated with them in advance and that rioters were permitted to block streets for a period of three hours. Earlier on Friday, the Tel Aviv District Court cancelled a stop-work order issued on Thursday night that prevented the carrying out of construction on the light rail station during the Sabbath. The station is situated between Bnei Brak and Petah Tikva. The attorney representing the transit system said work during Shabbat is of "vital" importance because without it, the ground on Jabotinsky Street could sink, endangering local homes and businesses.